So as we were planning our trip, a tweet from @gingerale, whom I follow, popped up. It was an amazing photo, and inspiring to me, as I was thinking about our upcoming travel. Since I knew we had South Africa on our list, I decided I needed to learn about this hike and plan a visit. In fact I replied to the tweet saying, I needed to do visit, and added it to my travel checklist. Oddly enough, finding the original photo so I could link back to my inspiration was a bit hard as @EarthPixs has since removed the photo. Luckily, nothing is ever really gone on the internet and a few google searches turned up the photo. However, I still don’t know who exactly to credit for the photo, so I will still just refer to the no longer working @EarthPixs post. Anyways, it is an amazing hike. It’s actually more what I would call rock scrambling. There is a nice standard trail for about 3/4’s of the hike, then it splits to the easy route or the chains and ladders route. Both routes are reasonably difficult and will require climbing with your hands and feet. The chains and ladders is more popular, but was very crowded so we only use it on the way up, opting for the less popular ‘recommended’ route on the way down. Some of the ladders are just metal hand holds bolted into rock. Others are legit ladders secured into the rock face. There are still many places you will be ‘scrambling’ up with hands and feet together over slightly challenging terrain. Besides a few overcrowded moments where we were are forced to stand with a crown by a cliff face, this is my favorite kind of hike, a mix of walking / climbing. The spiral climb is amazing because you get to see the view from all sides of the mountain. It still has nothing on the 360 degree panorama you are treated to if you reach the peak. I was really happy to have to chance to experience this ‘todo’ item. It took us 3h40min because of crowds and a picnic lunch in the shade of a cave on the way down. Going our normal speed without crowds it would likely still take 2h30min. yes we were on top of that! Finally the beach you see below our feet is Camp’s Bay Beach, which was so beautiful that we had to make it our next stop. Down the mountain and straight for the sand. The view of Lion’s head, which we had just summitted, from just outside out beach umbrella was impressive. 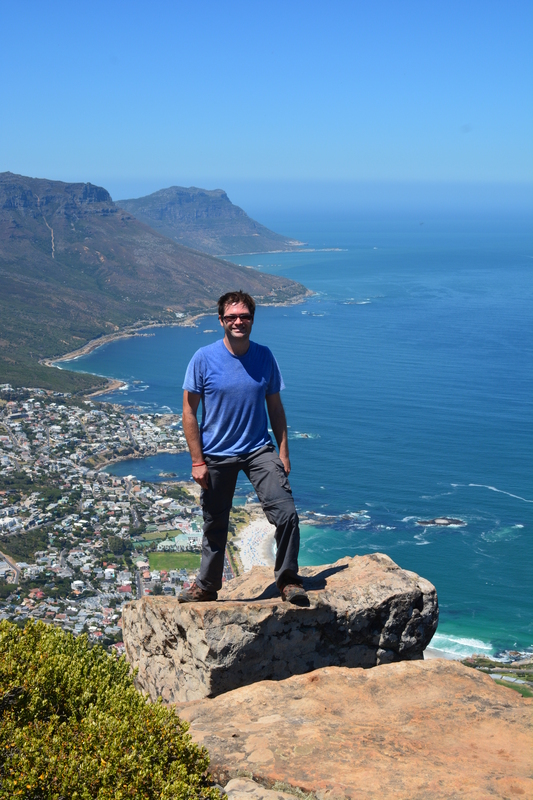 If you ever have a chance visiting Cape Town for Lion’s Head hike, I highly recommended it. Just might want to visit during a less crowded time than Christmas and New Years, as everything is packed even the trails.